At the Law Office of Stephen Weyer, LLC, we’ve always known that the only thing certain in life is change. This is not something to fear — rather, it is a reality around which to be prepared. As a business that serves clients by helping them make plans, we always emphasize the importance of being alert to the possibility of changes and new opportunities. At the end of October 2018, The Law Office of Stephen Weyer, LLC, will close, and I will join the estate planning firm of Cohen & Caproni LLC in Sandy Springs, Georgia. This move represents a great opportunity to continue serving estate planning clients and to offer them additional insight, experience, and expertise. The other attorneys of the firm - Walter, Al, and Morgan - are a great team, and I am excited to join them. If you would like to work with me and the other attorneys of Cohen & Caproni, I hope you’ll be in touch. To my wonderful clients: Thank you for the trust you have placed in me. It has been a pleasure serving you, and I hope we will continue to work together through all of life’s changes. It used to be common for attorneys to retain possession of a client's will. Once the attorney was informed of the client's death, the attorney would review the will and notify the executor. Nowadays, many attorneys, myself included, will not hold original wills for their clients. (I keep only electronic copies of the scan of the document after it was executed.) Instead, it is the responsibility of the client to keep and protect the will. With that in mind, clients ask, "Well, where should I keep it?" 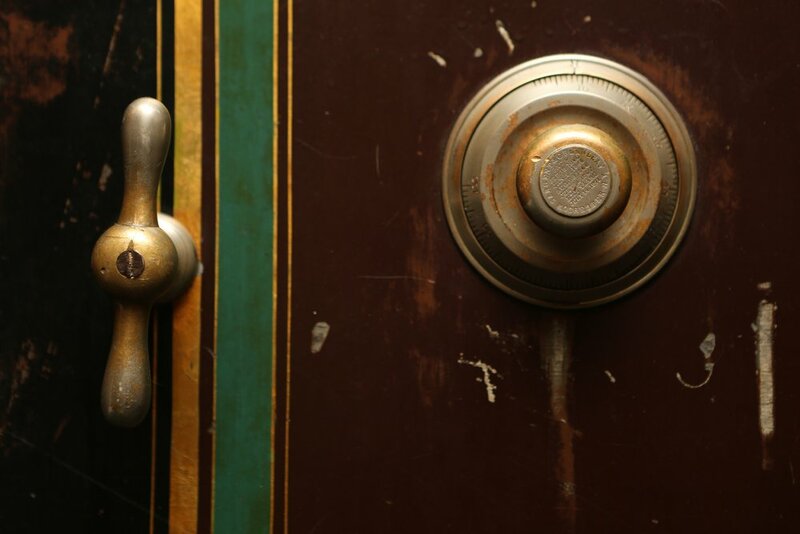 The instinct of many folks is to keep the original will in the safe deposit box at the bank. This is not the best option if you do not have a spouse or other co-renter on the safe deposit box contract. These boxes are sealed upon your death; without Letters of Administration it can be tedious and time consuming for your purported executor to gain access to it. Importantly, a person who has a Power of Attorney for you during your life cannot use that authority to access your safe deposit box after your death. Similarly, a deputy on the box might not have access to the box after your death -- be sure to check the rules with your bank. A better alternative may be to keep your will in a fireproof box on a shelf in your home. Keeping the will in a fireproof box will (hopefully) protect it from fire, and keeping it off the ground will (hopefully) protect it from a flood. I've heard the recommendation that the box containing the will should be closed and latched, but left unlocked. The logic goes that, for the thief, a locked box contains the possibility of cash or a gun or something else worth stealing; an unlocked box that is revealed to only contain papers will be left alone. Keeping the box unlocked also makes the will available to your family without them having to struggle to recall the combination or locate the (typically very small and easily misplaced) key. If you have a deed to a cemetery plot, keep that in the same accessible place as the will. Your will and cemetery plot deed likely do not have the sort of information in them that would be immediately useful for identity theft. Another alternative, specific to wills, is to deposit it with the county court. In Georgia and many other states, this can be done for a nominal fee. Once deposited in the court, the document will remain sealed until the court is notified of your death. or until your remove it yourself. If you choose to store the will with a court, however, it is essential that you inform your named executor. While storing a will at the court is safe, it is not a common option, and it may not occur to your executor to look there. Finally, if you decide to write a new will, you will need to return to the courthouse to recover the one filed there to destroy it. If you move after you store the will with the court, be sure to withdraw the will and refile it in your new location. What about other documents, such as birth certificates, property deeds, car titles, original social security cards, marriage certificates, and savings bonds or other securities that aren't generally kept by banks? These are documents in which the original can be important and difficult to replace. They also may be useful to identity thieves. And they typically are not needed in the first few days after your death. Instead, they may be useful during the estate administration process, once an executor or administrator is in place. With that in mind, if you have a safe deposit box, these documents could be placed there. If you have a more secure home safe, like a locked gun safe, these documents could be safely stored within. A locked file cabinet, while somewhat less secure, may also be an option for many people. Some other documents should be treated differently. An Advance Directive for Healthcare, for instance, should be copied and distributed to your healthcare agent, your back-up agents, your doctors and other medical treatment centers, and, if appropriate, to your family. Keeping this document locked up or hard to find obliterates its value. Keeping a photos of your own Advance Directive and those of the people for whom you are a healthcare agent on your smartphone may be helpful in case of an emergency. A general Power of Attorney should be held by both you and your Agent(s). While Georgia law recognizes the validity of a copy of a Power of Attorney, for real estate transactions the original document will be needed. There may be a benefit of also keep with your Power of Attorney instructions on how to terminate the document if needed. No matter where you keep your documents, it is important that you let your loved ones and intended Executor know where the documents can be found. If you have a locked home safe, make sure someone knows how to open it. The days immediately following a death can be stressful - providing your family and friends clear guidance on how to gain access to these most necessary documents is a kindness. Updated August 21, 2018 to include additional information about storing a will with the court. Yesterday evening I gave a presentation to about forty people after Mass at Our Lady of Lourdes Catholic Church in Atlanta, Georgia. I discussed the three primary documents of estate planning: an Advance Directive for Healthcare, a Durable Power of Attorney, and a Will. I also explained how there is a Catholic version of the Advance Directive for Healthcare, that takes into account Catholic teaching about end-of-life decision-making, and I addressed some of the differences between this document and the statutory version the State of Georgia has promulgated. We also discussed beneficiary designations, charitable giving, and general advice for estate planning. If you could not attend the event, you may find the slides and handout here. Some of the items discussed that are not addressed on the slides include (a) the difference between a Healthcare Agent and a court-appointed Guardian, (b) how a person ethically weighs the burdens of medical treatment against the good that it can do, and (c) the current estate tax exemption. If you would like to learn more about this presentation or if you have any questions about estate planning, please contact me at 404-860-1313 or steve@weyer-law.com. This blog post is from a January 2018 post on my previous website. A client called the office today and asked about putting together an estate plan for her family. It was a New Year's resolution, she told me. It's something she had been meaning to do for a long time. She isn't alone. Many people have "get a will" somewhere deep on their to-do list. According to a Gallup poll conducted in 2016, only about 44% of American adults have an estate plan in place. An ABCNews poll found that even fewer American adults have a healthcare directive or similar document. Perhaps it's time to turn this resolution into a reality, because these documents can go a long way to protect your family. For a single adult without much in the way of assets, basic planning for 2018 can be as simple as preparing an advance directive for healthcare and a limited power of attorney. These basic documents will allow a friend or loved one to act as your agent for medical decisions and legal matters if you were to be hurt in an accident or became unable to make or communicate decisions for yourself. For parents with minor children, your 2018 goal may be planning what would happen if you were unable to care for your child. In addition to the advance directive for healthcare and power of attorney, important documents for parents can include a simple will with a guardianship nomination and testamentary trust. For parents of children with special needs, specialized trust structures should be established to maximize eligibility for certain benefits. For someone with an estate plan already in place, your 2018 estate planning goal may be reviewing changes that have occurred in 2017 and ensuring that your plan continues to match your priorities and wishes. Did you experience a big change in your assets by inheritance, buying or selling a business, or purchasing a property? Did your family structure change because of births, deaths, adoptions, or divorces? Do the agents you previously identified in advance directive and power of attorney documents continue to be the right people to make decisions for you if needed? Updating your documents with new and relevant information is an important step in making sure your estate plan still does its job. Make 2018 the year you cross estate planning off your to-do list. This blog post was originally published on May 10, 2018 on my previous website. A recent article in the New York Times (linked here) tells the story of Ms. Sylvia Bloom, an unassuming 96 year old who had quietly amassed a fortune of nearly $10 million dollars and then gave it away. During her career as a secretary at a prominent Manhattan law firm, Ms. Bloom make small investments into the same funds that her bosses were buying. Over decades these small investments grew and grew, until they became millions of dollars. When Ms. Bloom passed away in 2016, her family and colleagues were shocked to learn that she had grown this fortune. This story has a few lessons for us all. There are lessons about investing: even small investments like Ms. Bloom's made regularly over time can eventually become large sums; there is no thing as a too small investment. There are lessons about frugality and savings: Ms. Bloom lived modestly, taking the city bus and remaining in a rent-controlled apartment, even though she had the resources to take private cars or buy a fancy home. Another lesson is the importance of creating a plan that reflects your wishes. For reasons that remain with Ms. Bloom, she didn't tell people about her savings and investments. Her money was split between three brokerage houses and eleven banks. Most of the accounts were in her own name, not in accounts that were shared with her late husband - Ms. Bloom's niece wonders if her uncle even knew about the money. But at the end, Ms. Bloom had an estate plan that directed her savings to good uses. "Ms. Bloom’s will allowed for some money to be left to relatives and friends, but directed that the bulk of the fortune go toward scholarships of [her niece's] choice for needy students." Ms. Bloom herself had been a student of modest means, attending public schools as a youth and then attending Hunter College at night while she worked during the day. One can imagine the satisfaction that Ms. Bloom secretly felt when she added more money to the accounts or saw their balances grown, knowing that this money would eventually go to scholarships for children and students. Regardless of what your goal is - having a plan will bring two benefits. First, it will help you actually achieve the goal. And second, having a plan and sticking to it will make you feel more satisfied every day. This blog post was originally published on May 16, 2018, on my previous website. 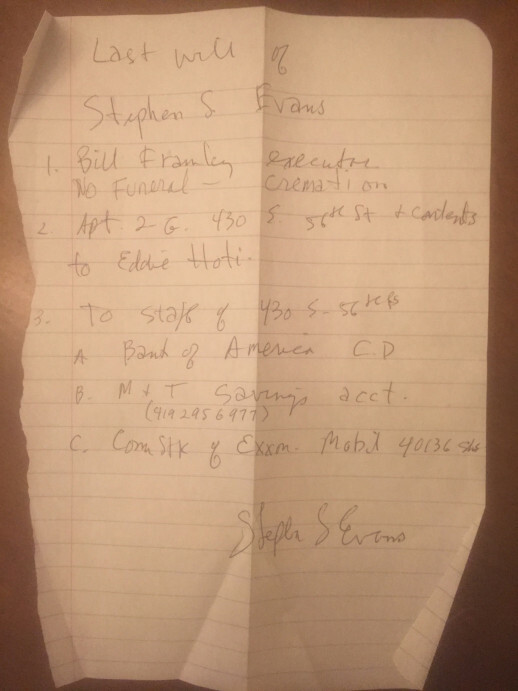 The New York Post had a recent article (linked here) about the fight for the assets of Mr. Stephen Evans, a Manhattan millionaire who passed away in 2017, apparently leaving behind only a handwritten note as instructions as to how to distribute more than $3 million in assets. The handwritten document, labeled "Last Will," left Mr. Evans's apartment to a doorman at his building and his stocks and bank accounts to be split between building workers. Despite the clarity of Mr. Evans's intentions, Mr. Evans's only living relative, a nephew, is contesting the document. Handwritten wills that were not executed according to the prescribed execution formalities (e.g., in the presence of witnesses) are referred to as "holographic wills," and they are subject to special rules that vary from state to state. Some states will accept handwritten wills that did not have witnesses so long as the handwriting of the testator can be confirmed. Other states refuse altogether to accept wills without the prescribed execution formalities, regardless of how the will was written down. Georgia is one of these states. Yet other states will generally refuse holographic wills, but have special exceptions. In New York, a handwritten will that was not signed in front of a witness is valid if it is written by a member of the armed forces (or a by a person who accompanies armed forces, perhaps such as a reporter) during a war or other armed conflict, but only until one year following discharge from the armed services (or, in the case of the person accompanying the armed forces, for one year after leaving the presence of the armed forces). A holographic will is also valid if written by a mariner, while at sea, but only for three years. See NY EPT Sect. 3-2.2. Since the elderly Mr. Evans did not fit into these special circumstances, his holographic will was not acceptable and was refused by the court. Presently, a search of Mr. Evans's possessions is ongoing to see if there is another, valid will. If one cannot be found, it is likely that the New York court will ignore this handwritten letter and distribute the wealth of Mr. Evans to the person next in line under the state's intestacy rules: the nephew. For want of witnesses when Mr. Evans wrote his will, his friends at his building will lose out on his generosity. Making sure that a will is properly executed is an essential part of making an estate plan. If you have questions, be sure to call an attorney.